Read this guide to find out. Degenerative disc disease is a serious ailment that affects millions of Americans. In fact, studies show that one-third of Americans aged 40-59 show early signs of the disease. The prevalence of this debilitating disease only increases with age. Read on for a comprehensive guide to degenerative disc disease. Explore the signs and symptoms of the disease, as well as the various treatment options. Also, learn how to live a fruitful life with the ailment. This disease occurs when your spinal discs become worn out. Wear and tear is normal as the body ages, but in this case, significant pain is reported by patients. Before diving more into the science behind the disease, it is important to understand how the spinal disks work. The purpose of spinal discs is to absorb shock traveling between bones in the spine. These discs allow normal human movements like bending and twisting. As the discs break down, pain begins to set in. There are a number of causes for the discs wearing out. One common cause is water loss, which flattens out the discs and reduces their shock absorption capability. Another cause is cracking or tears along the outer spinal wall. The most obvious sign of disc disease is significant pain in the back and neck region. The location and persistence of pain depend on the patient and where the weakening discs are. Some patients report pain as far down as the thighs and buttocks. Others do not feel pain while they are mobile, but only when they sit down. Certain movements like twisting and bending may trigger pain. For some, the pain comes and goes by the day or week. First, the doctor is going to ask you a series of questions. Specifically, he or she asks where the pain occurs, how often, and what causes it. The next step is a physical examination. The doctor may ask you to perform certain movements and strength tests. Another physical test is using a reflex hammer to check nerve function. If further testing is required, the doctor will prescribe diagnostic tests. These tests include imaging, such as MRI or CT scan, and a discogram. Once the issue has been diagnosed, treatment can begin. The simplest form of treatment is back stretches and low-impact exercising. In some cases, the recommended treatment is spinal manipulation by a chiropractor. When severe pain is present, doctors often prescribe painkillers. 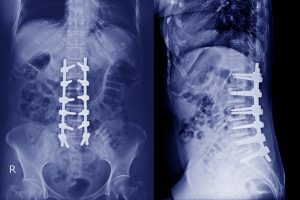 The worst case scenario is spinal surgery after all other options have been exhausted. Some patients prefer to go the route of alternative medicine. This includes acupuncture and herbal remedies to treat the pain. Degenerative disc issues cause substantial pain and discomfort. The key is detecting the symptoms and seeking treatment from a medical professional. Taking steps like spinal manipulation or acupuncture are effective treatment options. If you think you have degenerative disc disease, please contact us to schedule an appointment today.